As we're over half way through September, I thought I would give y'all a little update on my goal of not shopping for unnecessary items throughout the month as well as share my thoughts from one of my recently read books. When I started out the month, I had no idea what to expect as I'm a pretty avid shopper. Online shopping tends to be worse than in-store for me, because Kyle and I often have our iPads or computer out during the evening after dinner. He reads articles, I shop. It's definitely not the most productive way to spend my time, but it's relaxing, and there haven't been many decent TV shows on lately. (PSA: #TGIT comes back the 24th!) Now, I would love to sit here and tell you that I've totally given up online shopping in the evenings and have started doing more productive things with my time, but the truth is, I still browse, I just don't buy. In the beginning of the month, I was having serious withdraws. I mean, I texted one of my best friends that I was a good friend, but I just couldn't watch her snaps while she was shopping. I avoided Target and Nordstrom like they were the plague, and my "wish list" grew to a mile long. After a while, I started reading in the evenings instead of being online. 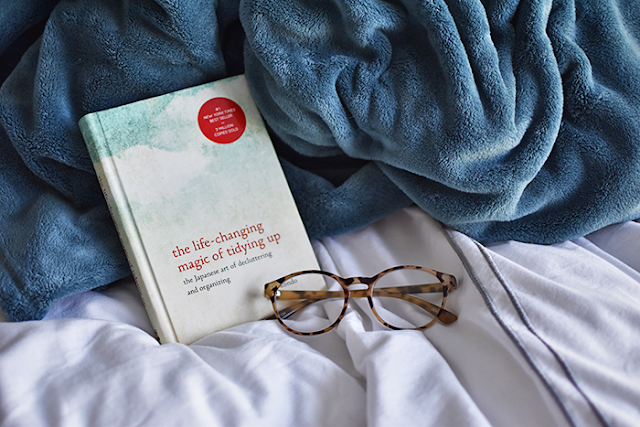 I'll definitely be doing a post of reading recommendations after this month, but one that stuck out to me was "The Life Changing Magic of Tidying Up". The book has become pretty popular as of late, and I saw a lot of reviews from bloggers that I follow, so I decided to pick the book up one day while we were at Barnes and Noble. That was over a month ago. I don't know why I didn't read it right away, or what actually possessed me to pick it up and read it this month, but I am so glad I did. Has the book changed my life and made me want to fully adapt the author's method of tidying up? No, but I did take away quite a few things from the book that I will be implementing in my life day to day. First, the author suggests cleaning your home in a short period of time, and starting with the easy stuff like clothes, and working your way up to the sentimental stuff. That way, when you reach the sentimental stuff, you're in the right mindset and will be prepared to discard what you no longer need. My next takeaway ties in with the first and is definitely one of my biggest struggles when cleaning out my home. Sentimental things are just that, things. You will always hold onto the memories associated with the item, but if it no longer brings you joy, then it no longer has a place in your home. That seems harsh, but do you really need to keep that gift you don't like just because it was from a family member or close friend? Along with sentimental objects, stuff I think I might use in the future (however distant) is another category of things I find hard to toss out. That outfit that might need a little bit of tailoring to fit just right, the book that you haven't read in months but you're "definitely" going to read next, or that super specific kitchen tool that never sees the light of day are all things that fall into this category. Our human nature is to be "preppers", we like to be prepared for whatever may come our way. But, Marie Kondo points out that item is taking up valuable space in your home. When you think about how much you spend to maintain/own the space you live in, do you really want it filled with items that don't bring you joy and you're just holding onto because you might use them? The last takeaway that I'll share with y'all is this - everything you own should have it's very own place in your home. Wouldn't it be wonderful to know where things are when you need them because they actually have a specific place? That would make my little type A brain so, so happy! Overall, I think the book is a very interesting read for anyone who is looking to organize their home or just loves different methods of tidying and/or organizing. Throughout the rest of September and probably some of October, I'll be utilizing the things I learned from the book to make my space one that truly brings us joy and contains the things that we really do love. And when I do finally return to shopping for things that aren't totally necessary, I'll take an extra minute to ask myself if that item really will bring me joy, or am I buying it just to buy something? Have you read The Life Changing Magic of Tidying Up? If so, what are your thoughts on the KonMari Method of tidying?